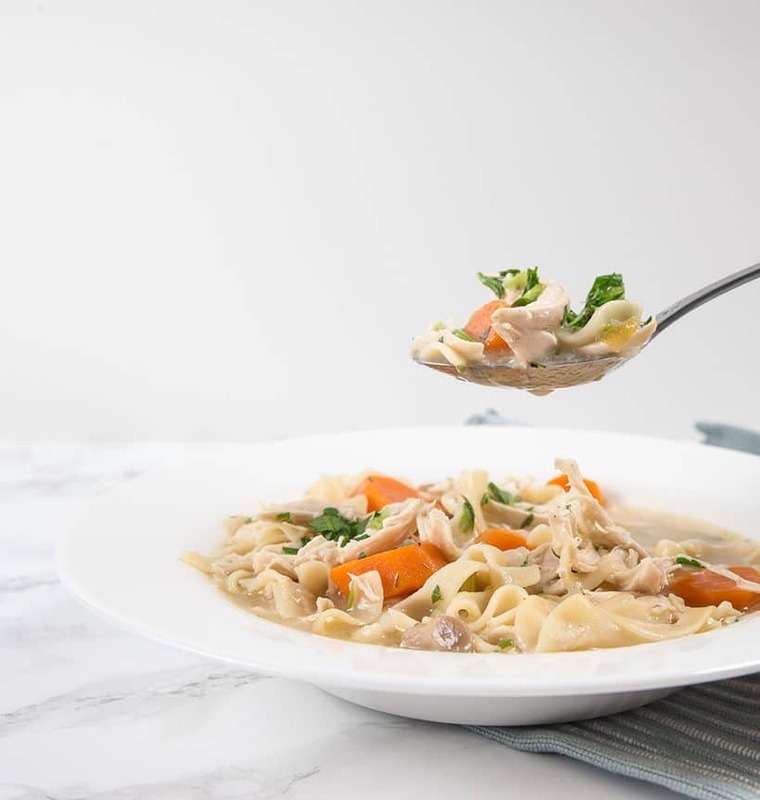 Make this homey Pressure Cooker Chicken Noodle Soup Recipe (Instant Pot Chicken Noodle Soup)! Made with real, whole food. No butter and true to the classics with no extra sauces. Healthy, simple, and soothing Chicken Noodle Soup is like a warm hug when you needed it the most. Chicken Noodle Soup always reminds me of the book series – Chicken Soup for the Soul. I always had a Chicken Soup for the Soul book in my bookshelf growing up. When I’m down, I would pull one out from my bookshelf. Lay on my bed, and read a few heartfelt and inspiring stories. Definitely mood-boosting, and makes you feel-good. On those days when you don’t feel right, you just want to stay in bed, under those warm comfy blankets. It’s extra uplifting & heartwarming when loved ones hand over a warm bowl of Chicken Noodle Soup. Easy to make – One Pot Meal! 1. Can I substitute homemade chicken stock with store-bought chicken stock? Yes, we tried this recipe with both homemade and store-bought stocks. Please note that the flavor will take a hit with store-bought chicken stock. Make sure to use an unsalted or low sodium version. Reduce ~12 minutes cooking time by bringing 4 – 5 cups of unsalted chicken stock to a boil & cooking the wide egg noodles on stovetop. You can do this while the chicken is cooking in the pressure cooker. Can’t see the cooking video?Watch it here. Healthy, simple & soothing Chicken Noodle Soup made with real/whole food & no butter/sauces. Homey like a warm hug when you needed it the most. 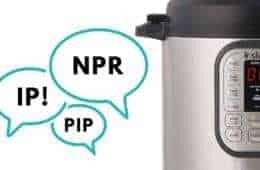 Prepare the Pressure Cooker: Heat up your pressure cooker (Instant Pot: press Sauté button and click adjust button to Sauté More function). 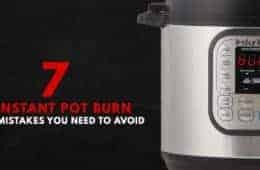 Make sure your pot is as hot as it can be (Instant Pot: wait until indicator says HOT). Sauté the Mushrooms, Onions and Garlic: Pour 1 tbsp (15 ml) olive oil into your pressure cooker. Add in the chopped white mushrooms, a pinch of kosher salt and ground black pepper. Stir to evenly coat the mushrooms with olive oil. Mushrooms start releasing their moisture. Let the moisture evaporate and stir occasionally until mushrooms are slightly crisp and browned. Add in diced onions, minced garlic and cook until onions soften and fragrant (roughly 1 - 2 minutes). Add in bay leaf, chopped carrots and celery. Stir and season with kosher salt and ground black pepper if you like. Deglaze: Pour ⅓ cup (80 ml) unsalted chicken stock. Scrub all the flavorful brown bits off the bottom of the skillet with a wooden spoon. Pour in the remaining chicken stock ⅔ cup (170ml). Pressure Cook the Chicken Meat: Partially submerge chicken breasts or drumsticks into the pressure cooker’s liquid. Close lid. For Chicken Breasts: pressure cook at High Pressure for 7 minutes + 8 minutes Natural Release. For Chicken Drumsticks: High Pressure for 8 minutes + 10 minutes Natural Release. Optional (see tips section): While the chicken is pressure cooking, bring 4 – 5 cups unsalted chicken stock to a boil on the stovetop over medium high heat. Shred Chicken: Open pressure cooker’s lid, remove bay leaf and chicken. Use fork to shred chicken. 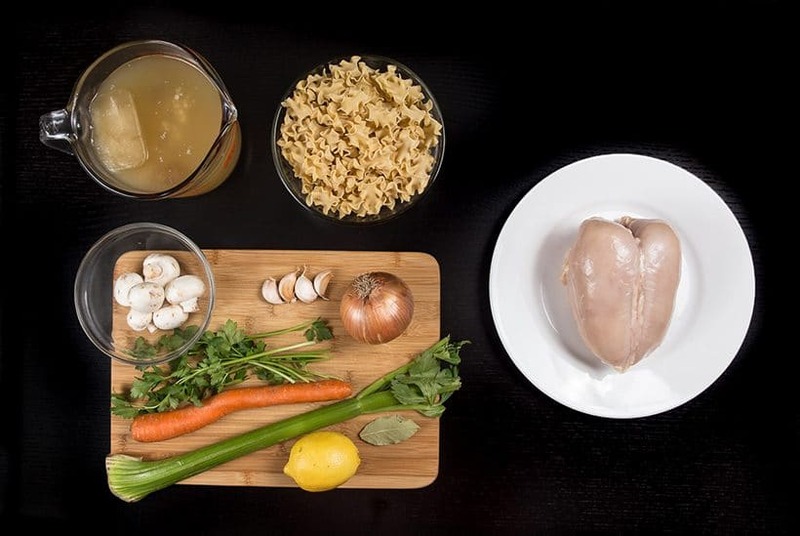 Make Chicken Soup: Pour 4 – 5 cups (1 L - 1.25 L) unsalted chicken stock into pressure cooker and bring it to a boil over medium high heat (Instant Pot: press Sauté button and click adjust button to Sauté More function). Cook Noodles & Season: Pour in wide egg noodles and cook until desired texture. Roughly 4 – 8 minutes. Season chicken soup with kosher salt (roughly a few pinches) and ground black pepper. Brighten with freshly squeezed lemon juice to taste (roughly 1 tbsp, 15 ml). Serve: Turn off the heat, add shredded chicken into pressure cooker. Garnish with Italian parsley and serve immediately. We tried this recipe with both stocks. Please note that the flavor will take a hit with store-bought chicken stock. Make sure to use an unsalted or low sodium version. Can I use frozen chicken breast? If so, how is the cooking time adjusted? Thank you for your question. I recommend adding an extra minute. I have had my IP for a week and have tried a number of your recipes, but this chicken soup recipe is my favourite so far! Flavourful and filling, great as a meal. My one surprise was the number of pinches of salt required at the end to really bring out the broth’s flavour. I like prepping meals for work, so I hope this freezes and reheats nicely. Can you use those frozen Reames egg noodles? 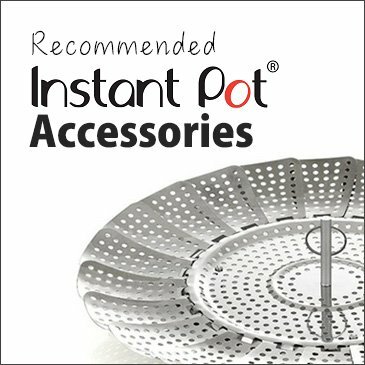 If so, can you use the instant pot pressure cooker to cook them since they take quite a bit longer than regular egg noodles? Thank you for your question. I believe they will take roughly 5 minutes. Hi Amy and Jacky you have done it again. I would never have thought to boil the rest of the chicken broth separately and add it after. I also added a few diced potatoes with the carrots and it turned out delicious. Thanks again for all your tips it sure does shorten the cooking time. Hi Amy and Jacky, thanks for working so hard to share so many great instant recipes. I really enjoy reading your blog and it has helped me a lot when I cook with instant pot. Can I ask if I can substitute wide egg noodle with pasta (e. g. shell pasta or spiral) ? I can’t find wide egg noodle in Singapore. If so, the cooking time of the pasta is the same as wide egg noodle? Shell pasta or spiral will work just fine. It will take roughly 9 – 12 minutes. Please taste and adjust accordingly. Well, this was our first meal made with our new Instant Pot. We followed your recipe closely, except we used a Costco rotisserie chicken. We were just curious how it would turn out. It was the best chicken noodle soup ever. Very pleased with the results. Thanks for sharing. Hi, I cooked a chicken last night , If I was to use a the cooked chicken should I make any adjustment to stock or cooking time ? I made the mistake of placing the noodles in the IP with the other ingredients. They turned to mush. Thank for advice to prepare on stove top separately. 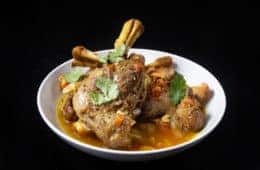 Could I use frozen drumsticks? what would the cooking time be? I wonder if this recipe would work using spaghetti squash (noodles)? I want to try using them in a soup. When scaling up a recipe, any tips on scaling up pressure cook times? If I double a recipe, would the pressure cook time increase proportionately or remain the same. My logic is the ingredients will still be exposed to the same amount of heat / pressure regardless of quantity so the pressure cook time will remain constant. Just want to get additional input. Just got a Duo 8Q. This site has been extremely helpful for a guy in the kitchen with a new gadget. Chicken soup seems like a safe place to start. You got it right. 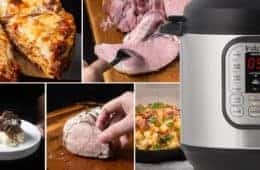 The pressure cooking time will remain constant for most of the recipes given it is not a larger and thicker piece of meat. Hi! I’m gluten free and would like to use rice instead of noodles. When should I add the rice (before or after pressure cooking) and how much would you recommend for this soup? If you want the soup to become starchy like congee or porridge, I would add the rice uncooked before pressure cooking. I would say about 0.5 cup of rice will be enough. Hi. I accidently bought chicken thighs. Do I use all 6? Seems like a lot. Will I need to adjust the cooking time? 5 or 6 sounds about right. How long do I pressure cook if I use a half chicken? What would the cook time be if I used boneless, skinless chicken thighs? The cooking time will be 6 minutes + Natural release, but you will really want to use bone-in chicken thighs for more flavor. Looks like a delicious recipe – can’t wait to try it! My family are not fans of mushrooms – if I leave them out, should I adjust the amount of liquid? No adjustment is needed for skipping the mushrooms. Hi! I have plan to use a small cornish hen (1lb) to make your tasty chicken noodle soup, but wanted to know if I needed to adjust the time? Thank you! No adjustment is needed. I would add in some chicken bones as small cornish hen flavor is quite mild for soup. A few months ago I was completely intimidated by my instant pot! Googling some recipes, I found you guys and after six of your recipes under my belt (with rav reviews from my family) I am a confident ‘pothead’!! Thanks so much for your easy to follow, delicious recipes!! This makes us so happy knowing you’ve braved through the initial intimidation and have become confident using your Instant Pot!! 🙂 It’s such a handy kitchen tool. And I’m sure there will be lots more yummy meals to come!! Feel free to reach out to us if you come across any questions. Wish you & your family a wonderful Christmas & blessed New Year! I have experienced many times that when use frozen chicken, I would get all the brown foam stuff coming out. What can I do to prevent that from happening? You can par-boil the chicken for a few minutes to clean them off first. Thank you for the recipe! This is the first time I made chicken noodle soup and chicken stock (also one of your recipes) and it was a huge success! My husband and my friend loved it! I’m looking forward to trying your chicken congee next time! Thanks Carol! Glad you guys enjoyed the chicken noodle soup. This was very good but our family of 3 ate the whole thing! I bought a 1.41 lb package of chicken breast that was bone in & I removed the skin before tossing it in. A total of 6 cups of chicken stock is necessary. Sprinkled the herbs about a minute or 2 before it was done boiling & squeezed 1/4 lemon right before serving. This was very flavorful. When I make it again I will get some breasts that are around 1.25 lbs. Pasta will be reduced to 5-6 oz bc after everyone took all the stock all that was left was pasta & chicken. Delish but no leftovers! Looking forward to hearing more about your IP food stories. Have fun!! I just bought my IP the other day, and am so excited to try this machine that promises to change my life, hahaha. I love making chicken noodle soup, and I usually use rotisserie chicken instead of chicken breasts (we buy one a week to feed our toddler chicken…perhaps I can now start cooking my own, but that’s another thread). How would I adjust for pre-cooked chicken, and do I use pressure cooking method with 6-8 cups of broth? It’s an IP 6qt brand Duo pot. You can use the chicken breast time in the recipe. I would separate the rotisserie chicken into 2 portions. Throw the bones, dark meats into the Instant Pot to infuse the chicken flavor with the soup. Then once pressure cooking has ended, I will stir the white meat into the soup and serve. Omg just saw that you answered my question about chicken thighs previously. THANKS! Take care & have a great weekend ahead! I usually cook the chicken on the bone for added flavor, but I wrap it in cheese cloth. That way it is easy to remove from the pot without bones falling back in. I then debone the meat on a cutting board before adding it back into the pot. Can you explain what the natural release is and if I have to set anything to make it specifically do a natural release? I want to make this tonight but I’ve just started using my instant pot and haven’t quite figured it out! If I just choose manual hugh pressure for 7 minutes like it showed in the video will it automatically do the 8 minutes of natural release? Thanks! Natural Release means you don’t touch the pot until the specific time. Here is an article on Natural Release and Quick Release. I figured it out ? a little google search, duh! This soup was UNREAL. my husband adored I think. The lemon really added such a beautiful flavour! Thank you for the recipe ? I have a go-to (stovetop) chicken noodle soup, but it has dairy which my husband might be sensitive to. So I finally tried yours, and it was not quite what I’m used to but so delicious. I might have sauteed it a little too much at the end, because it wasn’t very broth-y. My husband and I prefer it that way, though! And I used chicken thighs (frozen). It was a one-pot meal success! Also, I microwaved the extra broth instead of heating it on the stove. Thanks for the recipe! Like Terri, I’m wanting to do a whole small 1.2kg chicken as I plan to make for 6 to 8 people thus doubling up on everything in the recipe. Would you suggest I cut into portions first, and should I remove the skin? I’m thinking I might brown it to start, then remove and follow recipe onwards. Browning will enhance the flavor. It will be easier to cut the chicken into portions. I would remove the skin at the end of pressure cooking as it will protect the chicken meat from getting dried. Best chicken noodle soup ever! We loved the added mushrooms and splash of lemon. I did add a little bit of Italian seasoning instead of parsley. Hubby and I approve. My personal favorite is 12 cups water, 4-6 chicken thighs (bone, skin, and all) , carrots, celery, onion, and garlic. I cook it all in the pressure cooker for 1 hour (a long time, yes, but it makes a great base stock). Separate the fat, shred the chicken (putting it back in the stock), and store the stock until needed. To the stock I can add egg noodles and a little water for chicken noodle soup, add rice for chicken and rice (cooked in the pressure cooker – 1 cup stock 1 cup rice). I have even heated up the stock with a little water to boiling and sealed in a thermal bottle with uncooked egg noodles in the morning for a warm lunch at work. My Grandmother used to use the same stock recipe to make Chicken Gumbo. The stoke will keep for a few days in the refrigerator or a few months in the freezer. 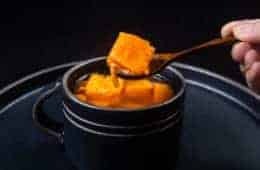 Freeze the chicken stock in a large cube ice tray, and it can be used to make small portion meals for the kids (nothing beats soup and a sandwich for a quick lunch). No added color, no added salt (only what is needed for taste), no preservatives, just good whole foods. I just finished making this for dinner. So easy and delicious! My husband actually doesn’t like garlic, onions, or mushrooms (I love them all), so I left those out and just used leek bulbs instead. It really turned out great. This might be my favorite soup in the instant pot yet!! Seriously, I have made it three times in the last month and it is just so easy, flavorful, and comforting. It makes my week when I know that I will get to have this soup for a few days. Definite winner and it will be a regular addition to my household menu! Thank you so much. First of all, I would like to sat that I made your chili recipe and it was a big hit. I love how you have made videos because it only makes following the recipe that much easier. My question is can I double the recipe and how would the cooking time change? Glad to hear the videos are helpful! You don’t have to change the cooking time to double this recipe. and also in Step 6, just pour 8 cups of chicken stocks (4 extra cups). Hi! For a quick way to shred chicken, put it in a mixing bowl while still warm and use your electric mixer. I cut the breast into smaller pieces, turn my hand mixer on high and move it back and forth through the chicken. It will shred the chicken in a jif! thank you for the great tip on shredding the chicken :)! Just got my Instant Pot this afternoon and this was the first recipe I cooked in it. It was so good and the perfect remedy for the rainy SoCal weather we’ve been having. My husband says this is the best chicken soup I’ve ever made. Thank you! I don’t usually comment on a recipe, but I made this in my IP tonight. We now have delicious soup for the rest of the week. Thanks for the recipe! Excited to try this for my kids! If I used chicken breasts with bones in, will the cooking time be different? Also, did you use manual setting when you were cooking the chicken? Bone-in Chicken breast will take 2 – 3 extra minutes to fully cook! How would I add rice to this soup instead of the noodles? You can add 1 – 2 cups of cooked rice (in place of the noodles) in Step 7. How long would I cook the chicken breasts if they are frozen? are you still boiling on saute mode? or are you putting the top back on and pressure cooking for 4-8 minutes? We are a family of two. I ordered an Instant Pot cookbook with lots of recipes that sound wonderful, but many recipes are for serving 4, 6, or 8 people. How do I adjust cooking times for fewer servings? You can usually half the recipes and the cooking time will remain the same. Hi, I have a question. I am putting a whole chicken in the InstantPot. How long do I cook it for? It takes roughly 20 – 28 minutes with 1 cup of liquid depending how big is your chicken. You cook the noodles directly in the broth, in the instant pot? Then add shredded chicken back in? Thanks! My husband just got me an Instant Pot as an early Christmas present, and we’ve both been sick with a cold, so I’m excited to try this. Quick question: when you say add the remaining chicken stock (2/3 cup), does that mean add only 2/3 cup and then add the other 4 cups later? Yes the other 4 cups should be add at step 6 as too much liquid would increase the go-up-to-pressure time and natural release time significantly. Merry Christmas to you and your husband. Hope you and your husband will recover soon. take care and have fun cooking! I made this tonight. It turned out great! I was skeptical about cooking the vegetables with the chicken, since I thought they would get mushy, but they were perfect. Thanks! I must have read this question somewhere but I don’t remember the answer. What is natural release. thank you. Natural release means not to touch the pressure cooker until the floating valve has dropped on it’s own. I’ve never tried pressure cooking! I’ve always been scared. Ha ha. This however looks so good, I may have to try it! I LOVE my pressure cooker for everything! Have been using it for years…especially for soups! We love making pressure cooker soups too! 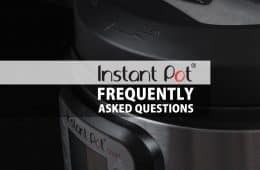 I would never think to make soup entirely in my Instant Pot – what a great idea! I really do not utilize it enough; I need to go through your archives in serious detail! Thanks Julie! Yes, Instant Pot is indeed a versatile pressure cooker. Hi! Love my Instant Pot 🙂 Can I sub bone in chicken thighs for the breasts? Would I split the difference in time between the breasts and the drumsticks? Yes, bone-in chicken thighs will be a great substitution for this recipe. Since chicken thighs are not as thick as drumsticks or breasts, we usually cook them for 6 minutes + 10 minutes natural release.